A system of morality which is based on relative emotional values is a mere illusion, a thoroughly vulgar conception which has nothing sound in it and nothing true. As I’ve written before, hate does have a home within America’s borders… if it’s the “right” sort of hate and being spewed by the “right” sort of “people” and at the “right” sort of victim. Indeed, if the author of the hate is possessed of what our domestic enemies call a “protected trait” the Left will be both quick and virulent in their support for- and protection of said hater irrespective of what they said. And, Ilhan Omar is their perfect example of such a “protected class.” She’s a “refugee” from Somalia, Black, Muslim, and a Female. 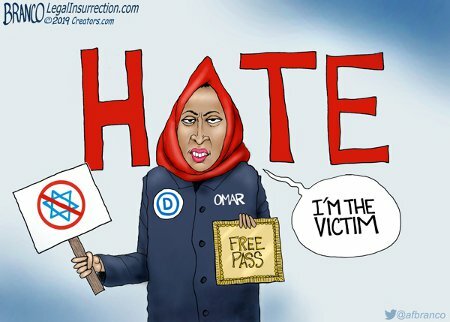 I’d say that the only way Omar would be better in the eyes of Liberals and Progressives is if she was a Lesbian, but being both Black and Muslim, they excuse her from the necessity of being homosexual. This entry was posted on Monday, April 15th, 2019 at 9:02 am and is filed under Politics, Society. You can leave a response, or trackback from your own site. Electing Muslims to office, even high political office, is a fast-growing phenomenon, mostly due to Muslims taking over whole areas and then always electing from within their own cult. This is, hence, a growing problem for America as a whole because Islam and America are not compatible to any noticeable extent. One need only look to the 5th Chapter of the Qur’an, which deals with governance and Muslim interactions with people’s of other religions in a legal context. And whosoever does not judge by what Allah has revealed, such are the Kafirun. And whosoever does not judge by that which Allah has revealed, such are the Zalimun. And whosoever does not judge by what Allah has revealed then such people are the Fasiqun. And therein is the problem with politicians such as Keith Ellison, Rashida Tlaib, and Ilhan Omar. They are Muslims and their religion demands that they govern strictly by the tenets of the Law as set for by Allah – i.e., Shar’ia, and only by Shar’ia. For them to try to govern otherwise would make them Kafirun ( Lesser Disbelievers), Zalimun (Lesser Wrong-doers), and Fasiqun (Lesser Disobedient). And we know how Muslims, devoutly follow their laws, deal with their disbelievers, wrong-doers, and those who are disobedient to Allah’s will. Nor is it surprising or dissimilar that the Muslim elected to political office are some of the most rabid, virulent, and uncivilized of our President’s enemies. Again, the Qur’an in the same chapter, instructs them that they cannot accept any non-Muslim as Auliya (Leader or even friend). They can only, on their very souls, have non-Muslims as subjugated peoples or as their enemies, obviously choosing the latter in the case the President. And see? That’s a problem. That poses a serious Question that the American people need to find, accept, and execute a Solution for. This entry was posted on Saturday, February 9th, 2019 at 2:04 pm and is filed under Politics, Religion. You can leave a response, or trackback from your own site. 2017 was a very interesting year, a true watershed in the history of the world, the West, and America. What makes it even odder to me that the one thing that sums up the highlights of 2017 actually took place in 2016, specifically on November 8th. Yes, 2017 was the best of years…for we, the People; it was the worst of years for those others living within the borders of our once and future great nation. This entry was posted on Sunday, December 31st, 2017 at 10:06 am and is filed under 2016 Election, Humor, Politics. You can leave a response, or trackback from your own site. « Do You Have TDS? 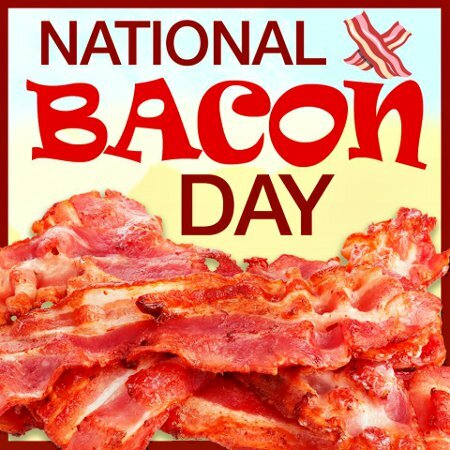 That’s right, My Fellow Americans; it’s Eid al-Kafir, the festival of infidels, National Bacon Day – not to be confused with International Bacon Day, which is on the first Monday of September in the US. And, on this day, we come together to celebrate our not being Muslims…with bacon! This entry was posted on Saturday, December 30th, 2017 at 9:13 am and is filed under Food & Drink, Humor, Religion, Society. You can leave a response, or trackback from your own site. 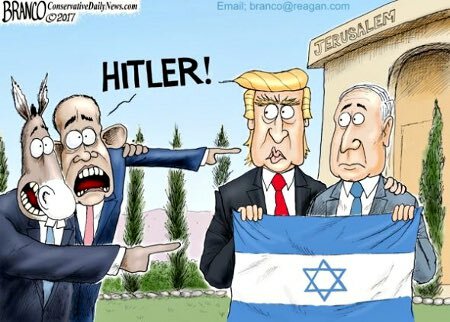 While the Muslims’ reaction, or lack thereof, to President Trump’s decision to move the US Embassy in Israel to the capital, Jerusalem was completely expected by all and sundry, the reaction to it by Obama and others of the boy’s ilk is, if not odd in tenor, nonsensical in detail. Then again, Obama is a Black and Blacks are socialized to be Anti-Semites. Also, so many Liberals and Progressives are similarly Anti-Semite and just love to compare Israel to Hitler’s Germany and/or Botha’s South Africa. Maybe this is less nonsensical than merely another shibboleth of our domestic enemies. This entry was posted on Sunday, December 10th, 2017 at 10:10 am and is filed under Announcements. You can leave a response, or trackback from your own site.